Idlis, the soft, fluffy white, round discs made of rice and lentil batter. This is a famous and authentic recipe of Tamilnadu. This recipe is meant for newbie cooks and hence I tried to mention in more details. My Mom sent me her Idli Cooker from India. If you have Idli batter ready in the fridge, you can have Idli's in the next 5minutes. But if you are planning to make Idli's ready and eat after few hours, its not good because Idli's then tend to get dry. 1). Fill about 1/4 cup water in the base shallow plate and microwave for 1minute. 2). Grease the idli moulds with oil and pour the batter. 3). Mount the idli plate on to the Idli stand and place it on the Idli cooker. 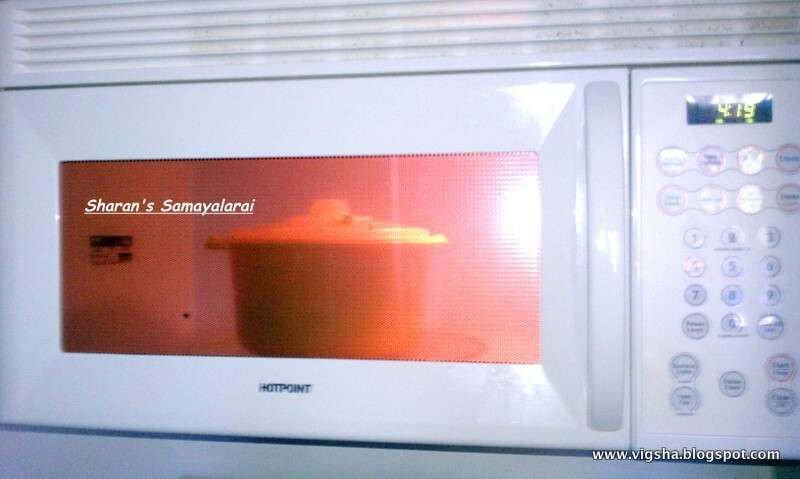 Cover with the dome shaped lid, Microwave for 4minutes. 4). Let it stand for 1minute in the microwave before opening the microwave door. 5). Remove and let it rest it for 5 more minutes so that idli's come out easily without sticking or show the Idly plate under cool running water. This helps in cooling the idlies faster and make it easier to remove it from the plates. Run the spoon around the idlies and flip them out. Soft & fluffy idli's are ready, cover and keep it aside. Tasty fluffy Microwave Idlis are ready!!! 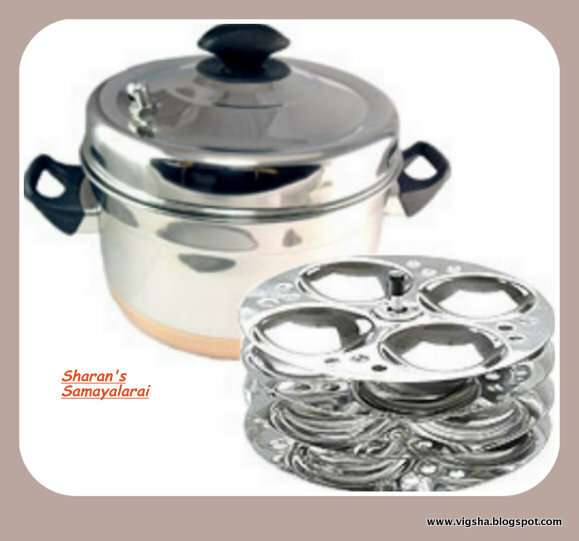 Serve immediately with sambar or chutney of your Choice. 1. When you remove the container from the microwave, then be careful as the hot steam coming from the container can burn your hands. Use a glove or a kitchen napkin to open the top cover. Keep your face at a distance and not too close. 2. The microwave cooking time varies so you need to configure what works the best for your Microwave. 1).For idlis, the batter should be slightly thick but of pouring consistency. If the batter is too thick, add a little water. Don't overbeat. If the batter becomes too thick or too watery, the idli's might not come as expected. 2). Grease the idle holder or pan well and fill each of thm with 3/4th full of batter. 3). Place this idly stand with filled plates in the vessel with boiling water. Cover it tightly and cook them on steam. The plates are perforated and allow the idli's to be steam-cooked evenly. 4). Steam cook idli's on medium flame for about 10 minutes or until done. 5). Overcooking idli's can result in very hard idli's and a dry crust on top. Its better to under cook them even, but make sure you don't overcook idli's. 6).Leave it for around 5-10mins before opening the steamer/cooker (or else, the steam falls on idlis and make them mushy). 7). Run a spoon under each impression to separate steamed idlies from the plate. Remove them all like this and get ready to steam the next batch of idli's. Always serve hot with chutney and sambar. 1. If you have Left over Idli's, store in the refrigerator and microwave with some sprinkled water on top. Serve immediately. 2. Cut them into pieces ad fry in Oil. Add coriander leaves to make it more tastier.